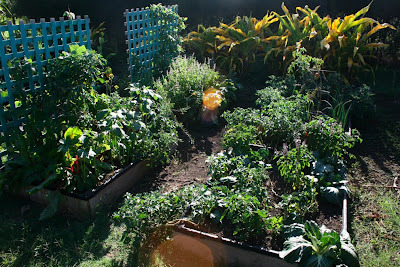 Here are some pics of our garden over the last year. I thought it would be a good exercise to review them as we are soon to give it an overhaul. Now that we know what grows really well and also what we enjoy eating, I'm looking forward to getting a new crop started. 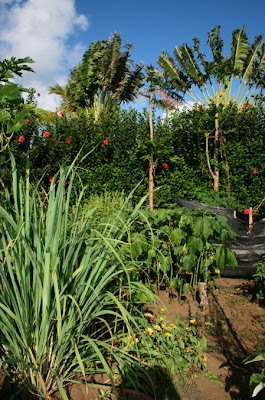 Lemongrass in the foreground. Okra behind. Conn wanted fried okra so I planted some and it grew like a weed. We had it deep fried twice. Otherwise the okra ended up in curries or stir fries. I'm not so keen on growing it again frankly. So that might not make garden v2.0. The black stuff was to help provide some late afternoon shade in the height of summer. This fall for some reason I really noticed the effects that the shorter days have on the garden. Little yellow pear-shaped tomato plant and broccoli. 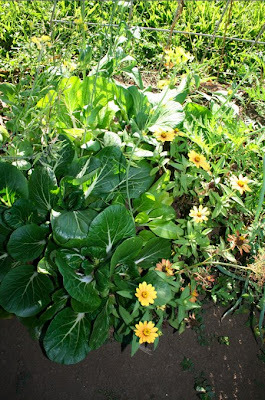 Bok Choi and Dwarf Zinnia. Just discovered this evening that Bok Choi doesn't freeze well. Too tough! These are new boxes that I built in the spring. Here they are with swiss chard, beans, basil, tomato, beet, bok choi, onion and even some parsnip. It started off with a bang but then the two boxes on the right slowed down significantly. I just thought it was lack of water. I later discovered some wretched root network choking out all the other plants! Aargh. Great work. 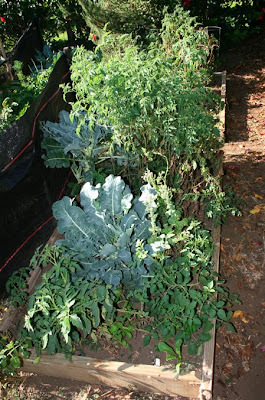 Did you buy or "make" the soil for the raised beds initially? How do you compost? Also, do you need/use rain barrels? Actually, the soil is a combo mix of our own compost, store-bought eco-compost made in hawaii, and some horse manure from our neighbor. I'm hoping that will suffice because my soiling testing came up low in all the major nutrients. Our composting is crude. 2 piles of short-term composting that we alternate and one green garden waste long-term pile. I have plans to enclose that one so it decomposes quicker. We have one rain barrel in the garden for quick and easy watering. Otherwise we use the household water from our catchment tanks. Thanks for the comment! Everything is SOOO green! Amazing and hard to see what is what. I am so lusting after all the yummy green veggies you have there! 1. Have you guys ever thought about bee keeping? That's always been one of my fantasies, should I ever leave the city. 2. 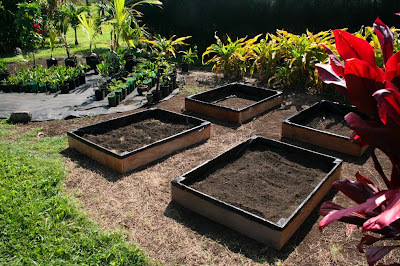 What about trying to grow the Hawaiian sweet potatoes? My friends on Kauai cook with them a lot, although i'm not sure if they grow them. They're SO delicious! chrys-i know it's difficult to tell what's what from the far shots. i'll move in closer next time! james-1. our friends in SF have hinted at beekeeping as well. we haven't gone there yet. but, i wouldn't be surprised if in the near future we do! 2. we haven't made a concerted effort to grow the sweet potatoes. our first attempt was uprooted by birds so i abandoned hope. we love them though. the costco here sells them by the box. i made a great stew with them, recipe via Emeril. one of these days we'll try again! Does Hawaii have an actual growing season, like the mainland? I would love to grow tomatoes year round. 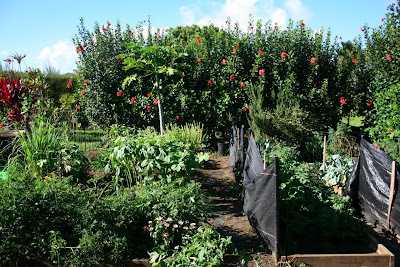 Where we are located on the island, there are seasons for growing certain types veggies. In the winter, the sun is very low in the sky and more rain. So it's a break from watering duties. But tomatoes grow like weeds here! Not as many of the pesky white flies in winter as there are in summer. You must plant more Okra. It is absolutely delicious.